The next time you take a leisurely stroll along a sandy beach, think about the millions of minuscule grains under your feet. Each of those tiny rocks is unique and has a story to tell. One could have been left behind by a volcanic explosion, another from the remains of a prehistoric creature. White sand often comes from limestone while coarser sand comes from granite. Sand Address Labels from Check Advantage are a basic design that celebrates the complexity of something we find all around us. Save time sending mail when you use these self-adhesive labels...because the sands of time wait for no man. 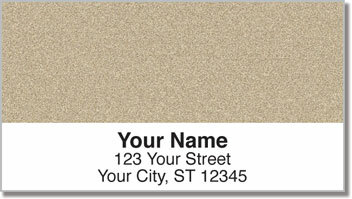 Get your own Sand Address Labels today! You can also find matching personal checks in the same design.